Believe it or not, taking vitamin supplements may help keep your mind sharp and even prevent or delay memory loss associated with aging. That's because deficiencies in certain vitamins can lead to premature cognitive decline. Knowing which vitamins to take for brain health can drastically improve your quality of life. Getting plenty of folate in your diet or taking a folic acid supplement is a key component of enhancing memory. A 2016 study published in Scientific Reports says study subjects with mild cognitive impairment who took 400 micrograms of a folic acid supplement for 12 months had significant improvements in cognitive function -- especially in tasks involving memory. Four hundred micrograms is the recommended dietary allowance (RDA) for folate for adult men and women (pregnant women require 600 micrograms per day). 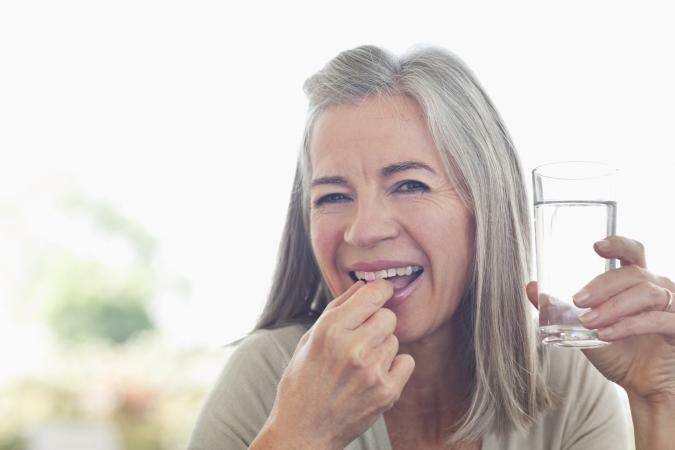 Older adults are at risk for vitamin B12 deficiency and being deficient in this essential nutrient can take a toll on your mind. One 2016 study published in the American Journal of Clinical Nutrition found low B12 levels are associated with poor memory. Another 2013 study says taking B12 plus folate supplements may slow rates of cognitive decline. While B12 supplements don't necessary improve memory if you're not deficient in this nutrient, taking them is a good precautionary measure if you're at risk for deficiency or have trouble absorbing vitamin B12. Adults need at least 2.4 micrograms of B12 daily. While B12 is an important vitamin for memory, a 2016 study published in the journal Nutrients says because B vitamins work together synergistically to support brain function, all B vitamins are equally important for optimal brain health. Therefore, it's important to take in adequate amounts of thiamin, riboflavin, niacin, pantothenic acid, vitamin B6, biotin, and folate on a daily basis. Use the Institute of Medicine's vitamin requirement chart to determine your individualized vitamin B requirements based on age and gender. More research is needed to determine which dosage of vitamin A is the right amount for optimal brain function. A 2012 study published in Dementia and Neuropsychologia says vitamin A appears to improve cognition (including memory), as it's worked in animal studies. But researchers who conducted the study say taking in too much vitamin A can be problematic. Adult men need at least 900 micrograms and adult women require 700 micrograms of vitamin A daily. Avoid dosages of 3,000 micrograms or higher unless your doctor recommends it, as this amount is the tolerable upper intake level for vitamin A. Iron is another nutrient that's needed in sufficient amounts for memory and other cognitive functions to work properly, says a 2014 study published in Neuropsychiatric Disease and Treatment. So if you're deficient in iron and you take supplements to get blood levels back on track, don't be surprised if your memory begins to improve. Men and women over age 50 need 8 milligrams of iron per day, and women of childbearing age require 18 milligrams (27 milligrams daily during pregnancy). While omega-3 fats aren't vitamins, these essential nutrients are a must to maintain overall brain health and enhance memory. One 2014 study published in Human Psychopharmacology found that supplementing with omega-3s (EPA plus DHA) improved brain function and memory in young adults. The University of Maryland Medical Center says omega-3s appear to help protect against dementia and Alzheimer's disease. To meet daily omega-3 needs, aim to take an omega-3 supplement or eat at least two serving of fish each week. The DHA/EPA Omega-3 Institute says healthy adults should get 500 milligrams of DHA plus EPA in daily, and adults with coronary heart disease should take in 900 milligrams (DHA plus EPA) per day. Consuming plenty of essential vitamin and minerals daily (to prevent deficiencies) is one way to keep your brain healthy and slow memory loss. But there are other things you can do for brain health that are equally important. Harvard Health Publishing suggests participating in mentally stimulating games (such as crossword puzzles and math problems), exercising regularly, following a Mediterranean-style diet, avoiding tobacco, and drinking in moderation (or not at all) to keep your mind in tip top shape.